Unfortunately, life has gotten busier for me so I haven't been able to close out this series. I keep hoping to have a bit of extra time, but I don't see a break coming. Now it's been a couple of sim seasons beyond season #75 and the results are less and less fresh as we move forward. I've had the player rankings done, but I haven't been able to do the little analysis write-up piece. At this point I'm just going to post what I do have though. The thing that makes Yim’s 2007 season so outstanding is not the fact that he is the best-of-all-time in any one category, but rather the fact that he is near to the top in many categories. Note that the decades on either end of the spectrum are hampered. For instance, it’s possible to have an outstanding pitcher from 2000 that did not make the top 75 list due to the fact that he was already an advanced age when the league began. Likewise, a rookie in 2075 is unlikely to make the top 75 list even if it is evident he will be on the list once he accumulates years of statistics. Also, the 2070s are even further hampered by the fact that only 6 years are recorded as opposed to the full 10 years from the other decades. 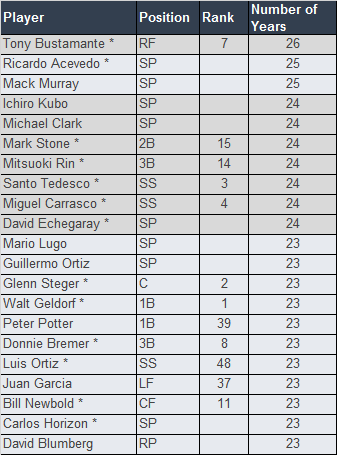 In this case, it’s very possible to conclude that the early-day pitchers are more plentiful, with half of the top 10 made up of pitchers from the 00’s and 10’s (Yim, Echegaray, E Castillo, Turner, & Lamela), and Dwyer being the only contributor to the 50’s, 60’s and 70’s. If you think the explanation for this lies within the created superstars, you’d be incorrect as Ryan Turner is the only created superstar pitcher in the top 10. This is interesting to compare/contrast with the ebbs and flows of NPBL run production. All leagues go through some periods that are more offensively heavy or predominately defensive and the NPBL is no exception. 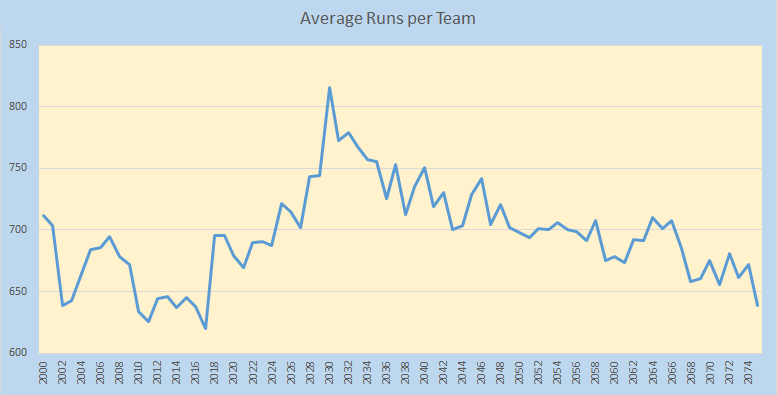 The graphs below show that the early decades of the NPBL were indeed pitching-heavy before an offensive spike in the 2030s. Since around 2035, there has been a slow and steady decline of offensive production to the point where the league is almost as run-scarce as its ever been. 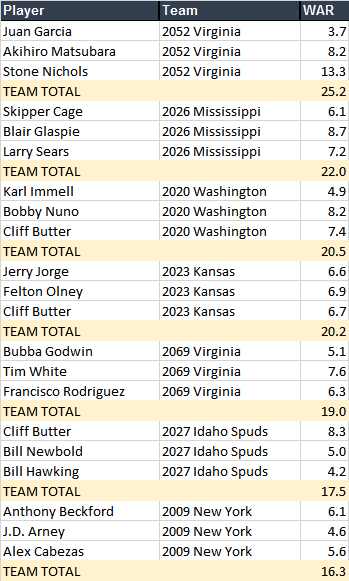 In 2040, the Idaho Spuds had two top 10 pitchers on its pitching staff: Todd Castillo and Wayne Beaman. It was one of only 4 years where 2 top 10 pitchers played the whole year for the same team. There is no bigger story in baseball this week. 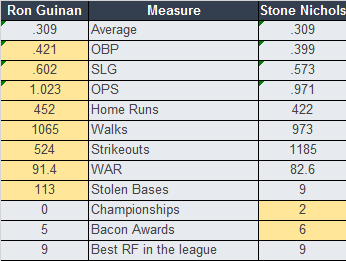 The NPBL's single-season Home Run king, Ron Guinan, is done. The 33-year-old surefire hall-of-famer, who hit an NPBL record 62 homers in 2028 and has hammered 50 or more bombs in each of the past 3 seasons, destroyed his back making a diving catch on September 3rd against the Rhode Island Reds. Guinan, who had a reputation for being brittle, was batting .348 with 42 homers and 115 RBI so far this year and was looking for his 4th-straight 50 homer and 7th straight 100-RBI season. He made the retirement official 3 days later. It may come as a surprise to some to see Guinan ranked ahead of Nichols. It’s very close between the two former Virginia Gray right fielders. Ultimately, what it came down to in my scoring system is that Guinan had a better YOPDI score – by a very slight margin. Both outfielders had 9 seasons as the top RF and both outfielders also had two additional seasons ranked in the top ten. Guinan was the second best RF in 2023 and the third best in 2021, while Nichols ranked 6th in both 2048 and 2058. John Yuda, the manager of both Guinan and Nichols ranked Nichols ahead of Guinan. My guess is that he did so due to the fact that Guinan was injury prone and often frustratingly found on the disabled list. However, he was in the lineup often enough to put up statistics that carried him to the top of the RF class. 6 - Issac Phillips 3B #17 – Won 5 championships for the Washington Griffins between 2018 and 2026. Then was traded to the Louisiana Blaze and picked up one more in 2029. 5 Carlos Horizon SP #30 – Championships with three different clubs: Kansas (2023), Mississippi (2030,2031,2033) and New Jersey (2042). Plus the following players that won 5 championships for the Washington Griffins between 2018 and 2026. Which is the greatest team in the history of the NPBL? My pick would be Aquilino Castillanos’ 2034 Minnesota team. They were the NPBL champion with the most regular season wins (118). The 2019 Washington Griffins had the most wins (119), but they failed to win the championship. The team with the best Pythagorean record (123-39) was the 2021 Washington Griffins (who did win the championship). Run differential sees the same 2034 Minnesota team at the top of the list. On the flip side, the worst team in the history of the NPBL comes from the same year. The 2034 Nevada team had the most losses in history (32-130, tied with 2028 Hawaii) and the worst run differential (-572). Larry Sears was a top 5 pick (#3) in the 2014 draft by Marcus Shuter of the Utah Scorpions. He was drafted just after Bill Worm (C #4) and Sanford Powers (3B #4). He joins 19 total right fielders on the 75/75 list that were drafted in the top 5. Right fielders on the list are, more than any other position needed to be drafted in the first round. Of the list of 75, 48 were drafted in the first round. As for drafting in the top 5, Marcus Shuter had moderate success. In all, he had 7 draft picks in the top 5. Two of the picks were big hits: Sears and Felton Olney (CF #3). One other (Wenjie Laverick CF #44) exceeded expectations. Three others were ranked, but did not meet expectations: Terry Macias (RF #62), Dacio Herrara (3B #57), and Herme Moreira (LF #73). Finally, one player (Terry McClain) did not make the 75/75 list. Under the quantifiable draft score system (explained in CF #6), Marcus Shuter has a score of 43.26 (for his top 5 picks alone). Using this scoring system and ranking ONLY the top 5 picks, the top ranked drafter is easily John Heinz. The following chart shows owners scores when separated by the various draft categories. Doing so allows us to see exactly where many owners’ strengths and weaknesses lie with respect to drafting. 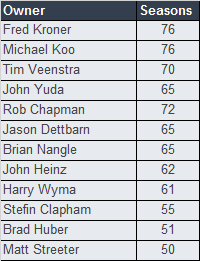 For example, it’s clear that Fred Kroner and John Yuda get the most out of their second round picks. Those two are far, far ahead of the pack. Meanwhile, that is a true weakness for me (Tim Veenstra). It turns out that I’ve had only 5 second round draft picks that have exceeded expectations, and 56 picks that did not make a 75/75 list! Butter spent his career between 4 teams: Washington (2017-2020), Kansas (2021-2026), Idaho (2027) and Utah (2028-2035). Butter would play LF, CF and RF. But at each stop, and for nearly his entire career, Butter’s outfield mates were ranked in the 75/75 list, and oftentimes were Hall of Famers themselves. What a close call! It wasn’t until I color coded the table above that I made a decision and my vote goes for 2052 Virginia. Having the three categories with a shade of green overcomes the one category that shows red. A lot of Hall of Famers (*) on that list. If you can find a guy who could play for 23+ years, you stand a good chance he’ll be a HoFer… Okay, I guess there may be a question on what’s the cause and what’s the effect on that one. The last type likely doesn’t contain players that missed out on superstardom, but I feel for them nonetheless. DiBennedetto’s career was spent between Massachusetts, Nevada and Kansas whereby he played for 3 owners that are now among the 50+ club – owners who have managed in the NPBL for 50 or more seasons. Brian Cook will join this club at the conclusion of the 2076 season and Matt Yordy needs 6 more seasons to make the list. When it comes to strength by owners, both Louisiana and Utah have split ownerships, so as far as total rank points, Rob Chapman tops the list. Dussault is “Mr. Colonel” in the way that Ernie Banks is “Mr. Cub”. Dussault was the one great star that the Kentucky franchise possessed during the organization spent in the bluegrass state. Dussault won 3 Tyson Bacon Awards. Two of those awards he won while only earning a WAR under 6.5. There have been only 10 times that dubious feat has been accomplished. It’s also worth noting that the GEL appeared to have the bulk of the top players at the time. 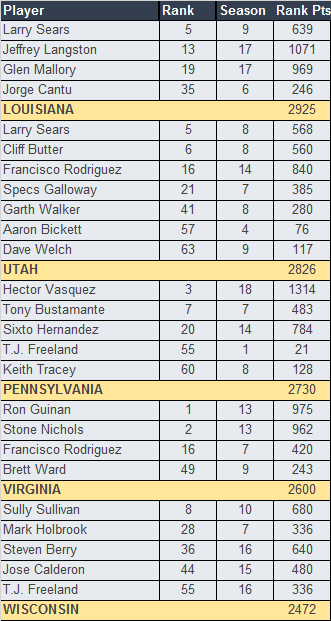 The top candidates in 2040 (when Buzzy Stevens won the award) are more impressive than the FFL candidates. Despite the fact that Andy Ping played his entire career with two other Hall of Famers (Donnie Bremer & Todd Neary), he never won an NPBL championship. In fact, he never even played in the championship series. This trio made the playoffs 9 times, but was always bounced before reaching the big stage. As amazing as this seems, it is not unusual. The New Mexico Dukes of 2000-2020 had overlapping careers of four Hall of Famers: Tanner Chayse (2000-2017), Malachi Sain (2000-2010), Steven Williams (2002-2017) and John Baptista (2006-2020). Yet the Dukes were only able to make the playoffs ONE time (2008), and in that single appearance they were knocked out in the LCS. In addition to that, the Michigan Militia of 2030 to 2050 also had 4 HoF with overlapping careers: Ed Hansen (2031-2048), Mark Sims (2037-2055), Rogelio Pessoa (2030-2043) and Keith Knapp (2030-2047). Those players made the playoffs 11-13 times, but never reached the finals. Denny Wills had a tremendous power/speed combination as evidenced in the table below. In 2013, Felton Olney was the #2 overall draft choice. He went on to win the Bick Horizon (Rookie of the Year) Award in the GEL that same year (2013). Which of these two is more valuable? Said another way: If your team was to be given either the Bick Award winner or the 1.02 draft slot, which would you choose? The club of players that have won the Bick include some of the greatest of all-time: Walt Geldorf, Buzzy Stevens, Andy Dwyer, Santo Tedesco, Michael Koo Jr… but it also includes a fair number of players in which winning the Bick was the career highlight. In fact, of the 140 players that won a Bick (in either league) between 2001 and 2070, 60 of those players did not make a 75 for 75 list. Basically, that means that owning a Bick Award means you have a little better than a 50/50 chance of having an above-average career. Therefore, it is slightly more preferable to own the 1.02 draft slot than it is to own the Bick Award winner. It probably won’t spoil anything to declare that the top ranked CF and top ranked RF both won multiple Bacons as well. Beckford is one of those guys to which I cannot associate with a particular team. I suppose he should be considered a NY Baron, since he spent the most years there, but the years spent in the Big Apple were the twilight of his career. His best years were in Colorado or Mississippi. Although I cannot associate a team to Beckford, Beckford does have one of the strongest associations to an MLB player for me: Ted Williams, probably because Beckford is the last (and only) NPBL player to hit over .400 in a season. Williams was a better overall player than Beckford (more home runs and walks and less strikeouts), but Beckford was every bit the pure hitter that Williams was. Classifying these statistics as “unbreakable” records may be a bit of a stretch, but I will say that I’ll be surprised to see any of them go down. - Is there a more anonymous super-star than Ethan Teller? Ethan Teller bears a lot of similarities with Summer Nelson. Both are right handed hitting outfielders who hit for good average and a lot of power. Both had consistently excellent stats year after year, but never won a Bacon Award. Both spent their careers with three different teams and their careers followed similar paths: traded from their initial team after 3-4 years, won multiple championships in their most memorable years with their second team, and finally traded to a third team looking for some veteran leadership to end their careers. What is the value of a draft position? 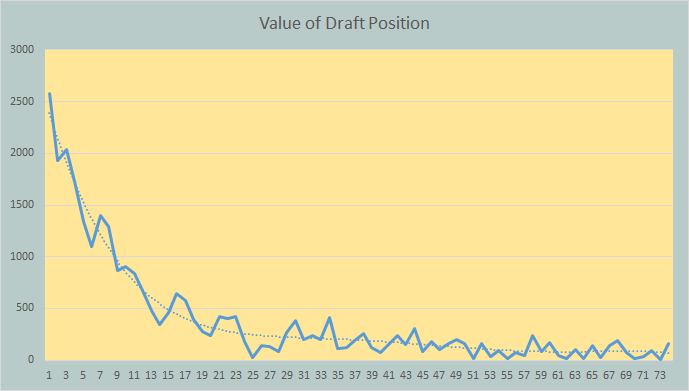 In order to answer this question, I added up the “rank points” for each draft slot. Rank points is simply 76-the players 75 for 75 ranking. This averages out to 11 players per position. As for starting pitchers, there are 47 in the Hall. Therefore I figured that the equivalent of a different position’s top 75 players is roughly about four times for starting pitchers. 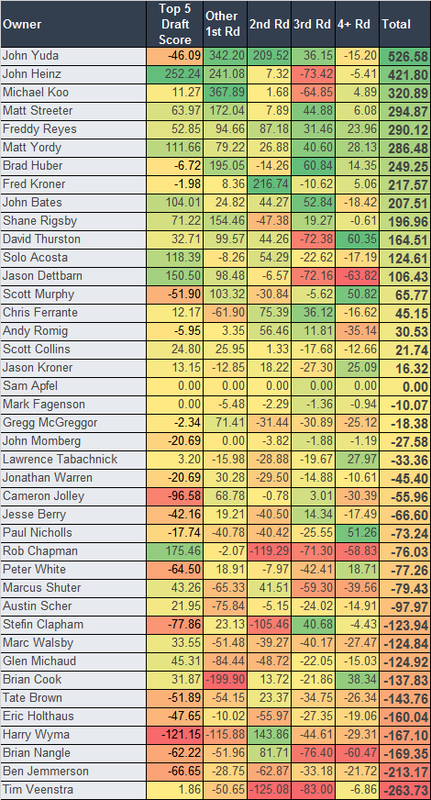 So for starting pitchers, I used the 75/75 rankings going all the way up to #300. The ranking points then became 301-Rank / 4 (rounded up). 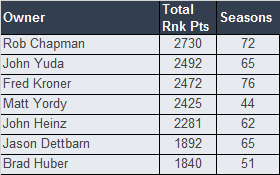 In this way, the top 4 pitchers all receive 75 ranking points, and pitchers 5-8 receive 74 points, and so on. The dotted curve represents a formulaic “curve of best fit”. The formula works out so that the draft slot of 2.02 where Dale Couch was drafted has a Rank Points total of 219.85. Since there have been 75 amateur drafts (not including the inaugural draft), that means the expected average for this draft slot is 2.93 – which equates to a player who is ranked #73. In other words, having the draft slot of 2.02 should, on the average, give you a player who would be ranked #73 on the 75/75 list (or a starting pitcher ranked 288-291). Anything less than that would have to be considered a disappointment. What we’ve seen in reality is that the 2.02 slot has performed better than the expected (aided by the HoF players like Couch pulling the average). The total rank points is 384, which connects to a player ranked #71. That may seem like a small difference, but in this context it is a fairly significant difference. C Maximo Cruz (#15) - 9 of the top 12 ranked catchers are in the hall. Another 2 of the top 12 are current players. The last player (Andrew Jones) I think might be in the missing years. Nobody outside of the top 12 is in the Hall. Cruz is ranked #15, so he's right there on the edge. Certainly deserves a very close look. 2B Sesto Benetti (#17) & Ron Seldon (#19). Like C Cruz, they are ranked right on the edge of HoF and non-HoF. They rank right behind HoFers Mark Stone (#15) and Mason Highsmith(#16) and ahead of Frank Gillbard (#20). 3B Javier Silva (#15) - Yet another player ranked right on that edge. Ranks behind HoF Grady McDonaghey (#13) and Mitsuoki Rin (#14) and ahead of Issac Phillips (#17) and Carmelo Fons (#22). SS Joe Powell (#35), Bob Crosby (#43) and Pedro Rivera (#58). The line of SS in the HoF vs out of the HoF is also somewhere around 20ish. So these guys are outside, but a case could be made. There are some "outlier", higher ranked players that are in the HoF (like 2B Zachary Matthews & SS Luis Ortiz) due to great defense or other reasons. And the 75/75 ranking is NOT the end all and be all measurement. CF Richard Samuels (#29), Miguel Calderon (#31), Jerry Baker (#33) & Armando Pagan (#46). See my comments about the shortstops on the ballot. The line for CF is also somewhere around 20ish. RF Victor Wilkerson (#15). Without revealing too much of my RF rankings, which haven't been published just yet, I'll say that Wilkerson is close to, but inside of the line where most of the HoF RF reside. He is a fringe case that I'll likely be voting in favor of this time around. RF Cody Morris (#29). A little outside of the line, but maybe there is a case to be made? SP Chadwick McCall (#78). It says something about how competitive the SP market is, but the line for HoF starting pitchers is right around 75. SP Skip Burns – Burns was a solid pitcher, having pitched in the majors for 20 years. He would be ranked #131 among starting pitchers. Considering that starting pitcher has the most competition for the 75 for 75, Burns is actually on par with position players like JD Arney and Norman Bates. That is, quality players that did not make the Hall of Fame. SP Hoya Jung – Catobase shows that Hoya Jung suffered a fairly major ratings drop in 2005 at the age of 24. Perhaps it was injury related? 3B Matthew Maglio – His development seemed to hit a snag. He was traded to Wisconsin (just before I took over the team) and he did have 10+ productive years for the Lumberjacks. They just were not special. SP Hugh Hoots – Similar to Skip Burns. He was an excellent starter for several different organizations. He would be ranked #105 among starting pitchers – which is really good, just not Hall of Fame material. SP Dmitrij Mitskevich – Was on pace to become a Hall of Famer, but he suffered a career ending injury in 2006 at the age of 24. One of only three players to steal 100 bases in a season. All three are shortstops. Is the stolen base coming back into fashion? 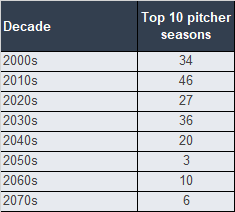 The average number of stolen bases per season by decade is shown in the table below. While the total number of stolen bases appears to be on the rebound, what is also interesting to note is the way the stolen bases are being dispersed. In the first three decades, there was more of a polarizing “players who stole bases” and “players who did not”. The table below shows the average number of 50+ stolen base seasons per decade. Therefore, when one looks at the stolen base records both by season and career totals, the lists are dominated by players from the first three decades. In addition to being one of the most proficient base stealers, Matt McQuade was also among the most efficient. He was successful on 81.4% of his attempts. The most efficient was Alfonso Camino with 89.1% (minimum 300 attempts). In fact, he leads this category by a wide margin. Speaking of stolen bases… during the first half of career, Santo Tedesco averaged stolen base every 6 games (about 27 stolen bases a season). Over the second half of his career, Tedesco would average only a stolen base every 23 games (about 7 stolen bases a season). It appears something suddenly zapped him of his speed around 2029. Nevertheless, he remained a top shortstop for another 10 years after that. In 2040, Carrasco was playing for Texas in the GEL. The GEL Bacon Award winner that year was Buzzy Stevens of Minnesota – who had a 12.3 WAR. The Bacon Award went to the rightful owner, it’s just that Carrasco had the misfortune of playing in the same league as Stevens. 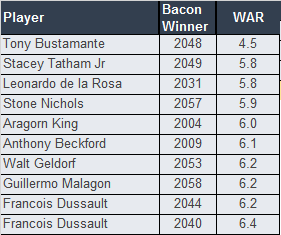 The FFL Bacon Winner in 2040 was Francois Dussault with a WAR of 6.4. Greyheme played for some of the great New York teams of the first two decades. The Barons had a bit of a reputation in those early days for choking in the playoffs. For a stretch of nine years, 2003 to 2011, the Barons averaged 109 wins a season and yet only won one NPBL title (2008). The “eyeball test” says that the Barons ought to have been able to win more championships than 1 during that era, but how many should they have won? 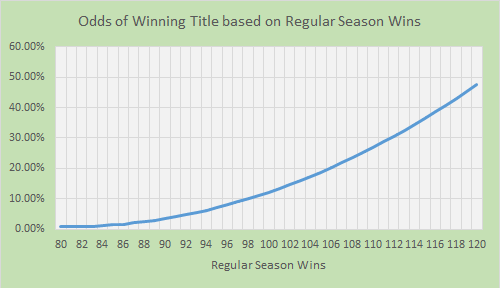 There have been 64 seasons where a team has won 109 games or more. In 16 of those season (25%), the team won the championship. If the Barons had had exactly 109 wins each season for each of those 9 years, the math says they ought to have won 2.25 championships. I thought maybe I could develop something perhaps a little more precise. The math starts to get a little funny with teams that have won 114+ games simply because the frequency isn’t enough. Using some of the data from the table above and a little bit of my own discernment, I worked out a formula which equates to the graph shown below. The sum total of the percentages is 239.34%. Which means mathematically, the Barons ought to have won 2.39 championships during this period. Good luck with the rebuild yuda. Chappy, I'll post some instructions in the Sim Instructions thread. Buzzy Stevens and Tyson Bacon may rank as the best 2 position players of all time. They are certainly two of the top five. Determining the better of the two is difficult. Buzzy Stevens ranks as the best third baseman in the league from 2030 through 2045 – an incredible 16 straight years. Not to be outdone, Tyson Bacon was the top third baseman from 2001 through 2016 – also 16 straight years. The next closest to this record is Bob Griffith with 11 straight years. In the end, what drives Stevens ahead of Bacon is that his power numbers and OPS are impressive even beyond Tyson Bacon’s stolen bases. (See table below). One of the things I find fascinating about Tyson Bacon is his development as far as avoiding the strikeouts. Early in his career, with California, Bacon would strike out about 20% of his plate appearances. Right about the time he was traded to Colorado, his strikeouts per PA suddenly dropped down to about 5%. He went from striking out over 100 times a year to merely 25. I’d say it was a Colorado coaching advantage, but the other Ram batters of the era, Christopher Cortese, Hal Rehm, Antony Kissel, Oscar Oakley, would regularly strikeout 100 to 150 times each year. Which averages to 96 wins a season. Only 2 losing seasons out of 19. I don’t know if that’s a record, but it’s got to be pretty close. Earlier (1B #6) I looked at the biggest fluke season. Looking over the year-by-year career of Sanford Powers, there is a case to be made for the 2nd overall pick in 2014. Actually, Powers does not enter the conversation for a single fluke season, but for a two year span, 2024 and 2025 are definitive outliers. For whatever reason, Powers suddenly and unexpectedly increased nearly every statistical category in those two years and pocketed the Bacon Award in both years. Then in 2026, Powers settled back into this normal self – which was undoubtedly impressive, but not other-worldly. Cristian Morales was selected fifth overall in the 2047 draft. 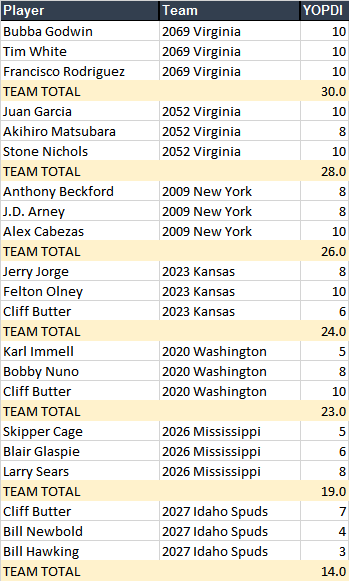 The 2047 was one of the deepest of all-time, with 14 players from the draft class making the top 75 list and 3 current Hall of Famers (Stone Nichols 1.02, Specs Galloway 1.17, & Mitsuoki Rin 1.21). Is it the best draft class? Probably not, but as with most things, it depends on how you want to measure it. Orati was the first overall pick in 2042. He is one of only three third baseman to be drafted #1 overall. 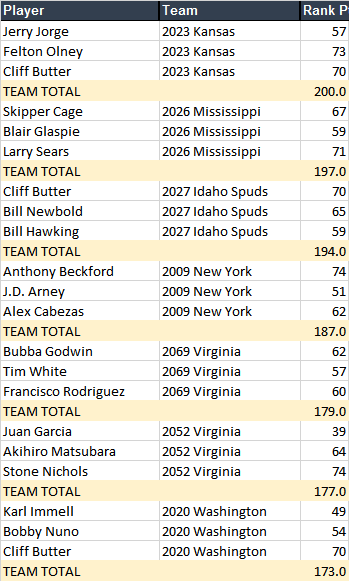 The others being Buzzy Stevens (ranked #1) in 2028 and Dacio Herrara (#57) in 2025. However, all of the top 10 third baseman were drafted in the first round (except Tyson Bacon who was created). In fact, you have to go down to player #18 Sergio Lopez to find a player that was NOT drafted in the first round. Player #25 Alex Orozco was an undrafted free agent who was scooped up by Hawaii. In all there are thirteen top 75 players that were undrafted free agents. In 2042, the NPBL contracted by 4 teams with New York, Texas, Rhode Island and Kansas going extinct. The players of these organizations were placed into a contraction draft. Taylor Dye was 29 years old and had just finished his 7th straight year of hitting over .300 with the New York Barons. The Florida Bluefish made Dye the 17th overall player taken in that draft. In all there were 13 position players taken in the first round of the contraction draft. RF Roberto Salazar 1.01 Kansas Immediately traded to Washington. Salazar had about 5 decent years, three of which were among the top 10 for right fielders for the year. Short career. Had to be considered a disappointment given his draft position and the promise he seemed to have. RF Gonzalo Molina 1.03 Pennsylvania 12 years among the top 10 for right fielders, but only once was he better than 4th at his position. A solid all-star type player, but no hall of famer. SS Miguel Carrasco 1.07 Maryland Although Carrasco’s best years were prior to 2043. He still contributed eight top 10 SS seasons for the Admirals including 2 years and the best shortstop in the league. SS James Shields 1.09 Tennessee 12 years as a “hold down the fort” type of player for the Hounds. RF Kyle Winfield 1.10 Idaho After a couple of very promising seasons to begin his Spuds career, Winfield fought for playing time for the remainder of his career. CF Kazunori Sato 1.12 Utah Either he changed his name, or he never made the big league. C Glenn Steger 1.13 Kentucky One of the most recognizable names in the pool, Steger was already 37 years old at the time of the contraction draft. Never a star during his Kentucky years. Steger was a contributor for a couple years and a hanger-onner for another two. RF Ewing Washington 1.15 Ohio Hit some home runs, but struggled everywhere else. A part-time player at best. RF Nelson Galvan 1.16 Hawaii His career started well, but de-railed quickly. 3B Taylor Dye 1.17 Florida 8 years among the top 10 at his position after arriving in Florida. Dye’s best years proved to be back in New York, but he was nonetheless a steady performer for the Bluefish. CF Carlos Solis 1.19 North Carolina Solis was a regular in the lineup for the Clippers for most the next thirteen years. However, as a starter, he was below average. 1B Matt Lancaster 1.20 Nevada Immediately traded to Kansas (although he would return to Nevada later in his career). His entire career came after the contraction draft and Lancaster is the 40th ranked 1B. Turned out to be one of the top players in the draft. SS Barrett Rowe 1.21 Virginia Another one of the top players in the draft. He had 10 years as one of the top shortstops in the league. Bob Griffith vs Lane Commons is a tough call. 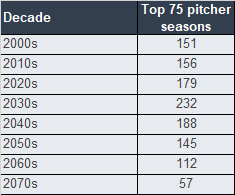 Commons’ best five seasons (see table below) rank a tiny bit higher than Griffith – due to keeping the strikeouts down. However, Griffith ranks ahead of Commons due to the fact that he has had a longer and better career (which is still going) and the fact that Griffith outshines his contemporaries at second base, while Commons had many other great second basemen in his day. Although winning the Bacon Award is not a consideration in the rankings, the fact that Griffith has won the award three times (compared to none for Commons) makes the ranking more palatable as well. 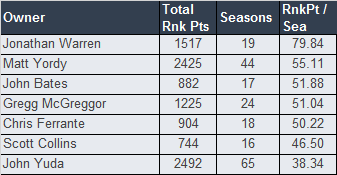 The table above (under #1 Bob Griffith) shows that 4 out of Lane Commons’ 5 best seasons occurred between 2014 and 2017. In those seasons, Lane Commons was 35 to 38 years old. In 2017, at the age of 38, Commons was the best second baseman in the NPBL. And then he retired. I guess he wanted to go out on top? Seamus O’Dule would be interesting to observe in real life. O’Dule hit .320 in his sleep with a lot power. I wonder where he got the power from with his 5’6” 185 pound frame? Although his nickname was “waterbug”, he wasn’t much for stealing bases. With a name like Seamus O’Dule, you’d be correct if you guessed that he was Irish. I picture him with bright red hair, a bushy beard and mustache and a green cap – but then maybe I’m influenced by the logo of the team he played for (Wisconsin). 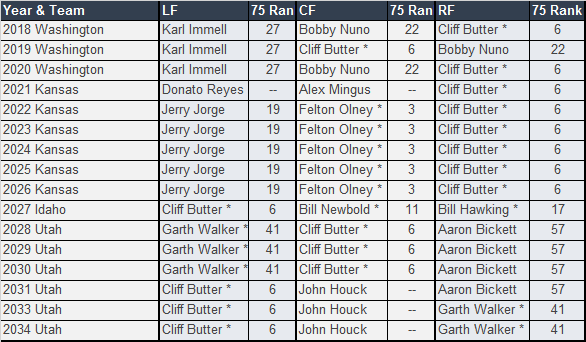 What was the greatest infield in the history of the NPBL (Part 1)? There are a couple of other factors that I would also consider when answering the question of the greatest infield: namely, how did each player perform compared to his peers and what kind of star power did the infield boast? I’ll cover these in SS #9. Brian Marshall holds a distinction that will likely never be beaten or equaled. He is the youngest major award winner when he won the Tyson Bacon Award in 2000 (then called the Babe Ruth Award) at the age of 18. Remember that the league began with the creation of super-players? Each owner was afforded an 18 year-old stud. It seems those stud players were not built ready to play in the majors as most of them did not become full-time players until around 2002. However, Brian Marshall was pressed into duty right away and responded with the MVP in the league’s inaugural year. It turned out to be the only Bacon Award that Marshall would win. Blinky Crouch didn’t make the list as a 2B, though he is pretty close. Second baseman have a higher proportion of great names compared to the other positions. In addition to Garmendia and Crouch, I also considered Seamus O’Dule, Magpie Foster, and Ludwig “Lobster” Claus. According to my ratings, Marvin Collins is the highest ranking position player that I can see was denied the HoF. On the reverse side, the lowest ranking position player that was admitted in the HoF is also a second baseman: #66 Zachary Matthews. Now my rankings do not consider defensive wizardry and that is clearly where Matthews made his mark. The fact that the MLB equivalent of the Gold Glove Award for the NPBL is named after Zachary Matthews is also a testament to Matthews’ qualifications. The exclusion of Marvin Collins is worth another look. 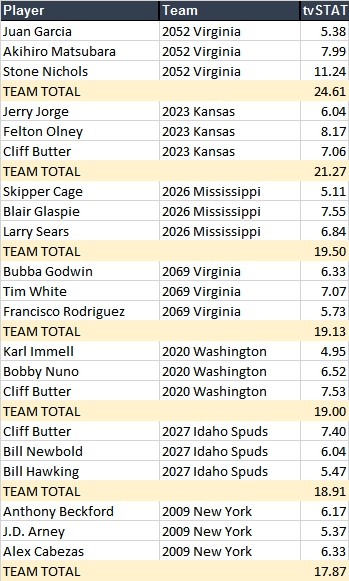 Below is a table of the best five years of Collins and the best five years of Adam Anderson (#11) and Frank Gillbard (#20), both of whom are included in the Hall of Fame. Gillbard’s power numbers (especially in his top 3 years) really appear to pop out, and Adam Anderson has an advantage when it comes to stolen bases. But Marvin Collins has an underrated skill: the ability to avoid strikeouts. Collins ranks ahead of Anderson and Gillbard for a couple of reasons. First, Collins’ best years are huddled together. The theory is that the reputation of Collins would continue to grow as he strung together consecutive outstanding seasons. The second reason is that Collins was compares considerably better than his contemporaries at second base. Collins was the best second baseman in the NPBL for six consecutive years (2042-2047) and the 2nd best twice (2041 & 2048). Adam Anderson, having played in the era where he competed against other super-players like Brian Marshall and Seamus O’Dule, was never better than the third. Frank Gillbard was only the tops in the league during his best two years – while competing with fellow HoFers Blinky Crouch, Mark Stone and Jack Hesse. Jake Young will be 35 years old by the time the season starts this year, but unless he is quite a bit better than he has been the past two years, it’s unlikely that he will rise any more on this ranking.